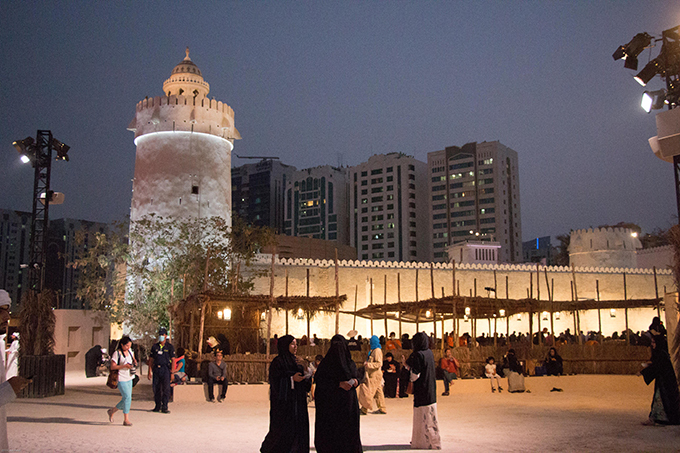 Lights shimmered under the clear night sky as people strolled around Qasr Al Hosn, the fort that built a nation. Music traveled with the masses of people, who sang along or chatted with each other as they visited booths that offered cultural merchandise. I realized I made the wrong choice of shoes when I stepped on the sand and saw that right in the middle of the festival area, a boat rested in a man-made oasis. Small waves swayed as the speakers produced the familiar sound of the sea that nurtured Abu Dhabi as it grew. The fort watched over the crowd, who came to celebrate the past. 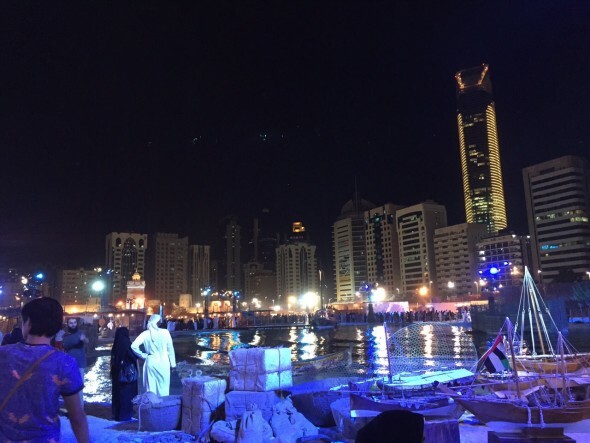 Having been immersed in Arab culture for my entire life, I did not think that a visit to the Qasr Al Hosn Festival would teach me anything new. I was wrong. 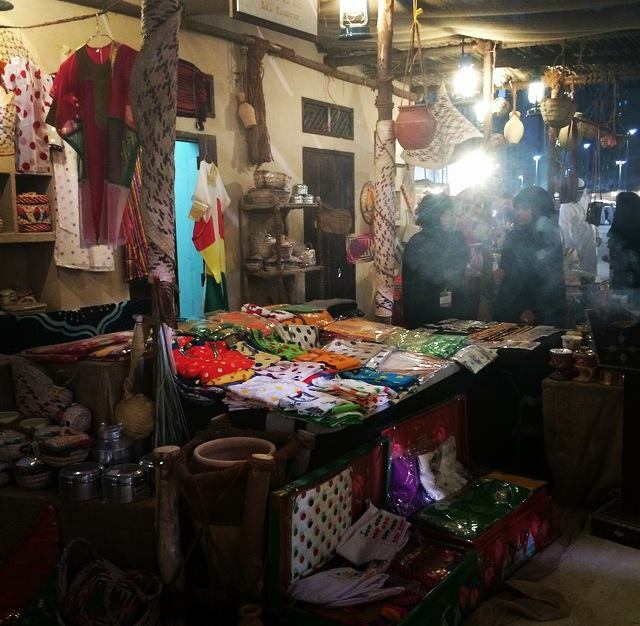 I walked from one booth to another, taking a look at the variety of abayas and kanduras displayed there, mixed in with the bright colors of Indian saris, accessories, and lanterns. Local women were selling herbs, drinks, and foods, and explained that their grandparents used these products for medical purposes long before they became available in pharmacies. I was embarrassed when one of my friends asked me about the meaning of an Arabic word on one of the products and I couldn’t answer, but my confusion showed me how language changes as it travels distances — or, more accurately — cultures. At the “shore,” I saw how the locals made their living before the discovery of oil. An aged man, with a forehead lined with wisdom, sat on Persian rugs as he knitted fishing nets. His hands made each perfect knot mechanically; it seemed so effortless but the sight of his thin, scarred fingers showed the opposite. Sailors and fishermen sat in the boat, and showed us how they used the fishnets to capture the fish, which they sold at the fish market. In another tent, we learned about pearl hunting. 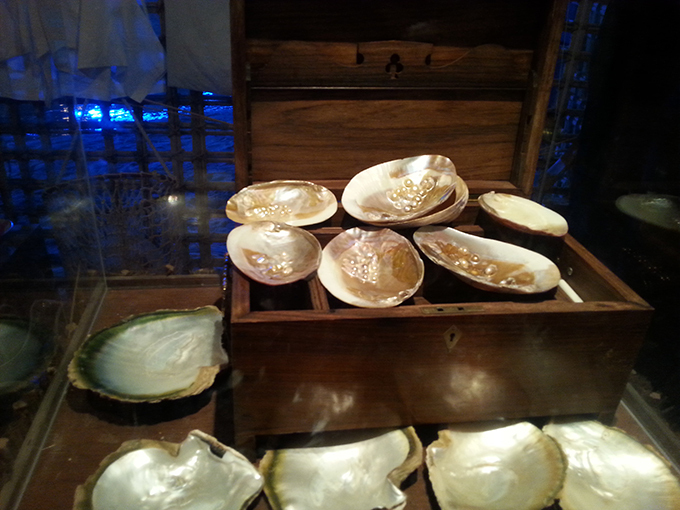 Divers used to explore the depths of the sea to capture oysters in the hopes of finding valuable pearls inside. While it brought wealth for many people and enhanced the country’s economy, this life-risking occupation marked a lot of people’s lives with tragedy. It wasn’t the life of risk compensation or workers’ rights; you had to summon the courage to dive in or watch your children starve. The accounts of history we learned in these tents challenged the common idea that this country started from the discovery of oil. Staring at the miserable face of a pearl diver in old photographs made people forget the stereotype of the Arab who is born with a gold spoon in his mouth. My next stop was the “Lest We Forget” exhibit, the name of which comes from Rudyard Kipling’s poem, “Recessional,” written on the occasion of Queen Victoria’s Diamond Jubilee in 1897. The phrase has been linked to memory ever since, as a plea to remember the sacrifices of the past. The “Lest We Forget” initiative follows the path of its name as it was born out of a vision of preserving and sharing the Emirati heritage. The exhibit, which was originally created for the Venice Biennale, started with a hallway of black drawers topped by a timeline of pictures. Viewers see the pre-oil era, and learn when the important landmarks of the UAE were built. The guide pointed our attention to a creative addition to the timeline: each landmark on the timeline in the UAE was drawn in white, while landmarks built in other parts of the world in the same year were drawn in grey. This feature allowed visitors to see how the UAE was developing in comparison with the rest of the world. It also reveals the jump this country made from its founding in 1971 to the present. I opened drawer after drawer and looked through a collection of memories that showed the birth of a country, from the yellowing pages of an old notebook used by pearl merchants to determine prices to the bottle that held the very first drops of oil that transformed the desert to a city. NYUAD students took part in the festival by having their own exhibition of the work they did with Professor Pascal Menoret in a course called “Modern Architecture in Abu Dhabi.” The students displayed an outline of Hamdan Street, one of the most important streets in Abu Dhabi, and showed off the street’s most important landmarks. My evening ended with a little food-tasting tour with my friends. The volunteers offered us a taste of the yogurt their ancestors used to make while another woman showed us the process of turning the milk into butter and yogurt by wrapping it tightly with a cloth and leaving it hanging from a stick for a while. Families sat on tables surrounding the little café, shaped like a cottage, which offered several Emirati beverages and snacks. At the far end of the festival, we waited in line to have a taste of the delicious luqaimat, everyone’s favorite Emirati dessert, from a food truck. The food truck presented a nice combination of the food of the past in the structure of the present. The Qasr Al Hosn festival offered everyone a distinct experience. Locals got a chance to remember and appreciate the history of their country, while expats got a glimpse of a culture and a past they rarely get to see. Just as the fort stands with all its antique glory between skyscrapers, so is the Qasr Al Hosn festival an image of a living history that guides us in our present.